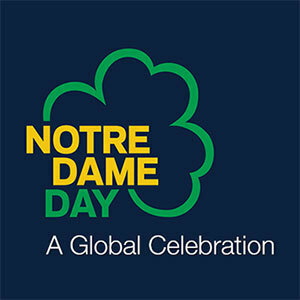 The University of Notre Dame family will gather April 27 (Sunday) to celebrate the first-ever Notre Dame Day and have the opportunity to watch, connect, give and vote in a way that’s never been done at Our Lady’s University. The event will launch at 18:42 (6:42 p.m.) April 27 in a nod to the founding year of the University, and end at midnight April 28. By way of a 29-hour streaming webcast, social media efforts, on-campus events and global participation, the Notre Dame community will share stories from across the University. The show will be streamed live on the web from LaFortune Student Center on campus and feature exclusive interviews, celebrities, performances and coverage from Notre Dame clubs and locations around the world. Notre Dame Day will also provide the opportunity for participants to make a gift and subsequently vote to direct a portion of more than $250,000 in challenge funds to their areas of greatest interest at the University. Donors will be able to vote for residence halls, academic majors, athletics teams or any of more than 300 other organizations at Notre Dame. Students will compete in hourly Residence Hall Challenges with $1,000 in prizes at stake between the halls for the on-campus competition. Hourly online voting challenges will enable those off-campus to support specific residence halls as well. Additional on-campus events include a student picnic on the North Quad, a golf challenge at the nine-hole golf course, and the Notre Dame Day hub at LaFortune Student Center. The date of Notre Dame Day marks a significant event in the history of the University. On April 23, 1879, a fire destroyed the Main Building, and therefore the majority of the campus. On April 27, Rev. Edward F. Sorin, C.S.C., the University’s founder, returned to Notre Dame and vowed to rebuild it, bigger and better than ever. To preview the broadcast schedule and on-campus events, and for more information, go to NotreDameDay.ND.edu. Originally published by Amy Shell at news.nd.edu on April 23, 2014.